Bring attention to your brand or special sales event with our bold, festive Colored Pixels sticker design template, an excellent choice for almost any retailer. 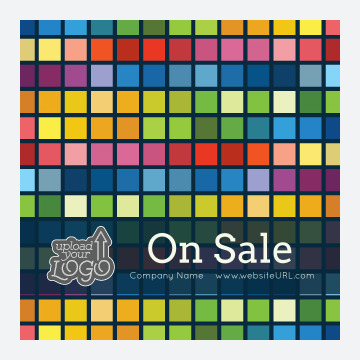 Colored Pixels displays a bright, multicolored squares background design with a translucent banner with space for your company logo, company name, website URL, sale message or other preferred custom text. Colored Pixels is available two shapes, three distinctive edge finishes and five different color schemes to match any brand. Create and print custom stickers with our online design tool today! Our online sticker maker lets you print custom stickers featuring your own company name, website URL, logo and message — whatever you want! All you have to do is select your template from our professionally-designed library, then point-and-click your way through choosing your color scheme, and customizing each text and design element. And when you’re done designing, you can generate a shareable free PDF to get valuable feedback from your team members before you send your project to print. PsPrint offers exceptional quality when it comes to printing custom stickers, which is why thousands of businesses trust us with their print marketing materials every day. From premium paper stocks to high-quality printing on state-of-the-art presses and excellent value, you can expect only the best when you choose PsPrint as your printing partner—guaranteed! Considering custom sticker printing options such as foil stamps or die-cut stickers? PsPrint’s custom printing team is on standby to assist you to get the sticker you envision. We also carry a full line of other pint marketing tools, including business cards, letterhead, brochures, postcards, and more!